Jeļena Šļihta is the project manager of LabieDarbi.lv, an initiative that invests in charitable projects. The initiative has been very successful, and Jeļena has been a big part of that success! When examining a project for selection, what is important to analyse? LabieDarbi.lv initiative has a clear regulation that clearly stipulates what should be included in the project application, but nevertheless in the assessment process we pay big attention to the social importance for an individual and for the whole society. I would like to also emphasize here, that we do not choose projects for the public voting based on the greatest benefit they could provide for the most of people. For us it is important to support different groups of people as well as individual efforts because support from LabieDarbi.lv initiative could help a sportsman, singer, dancer, or any other person to spread the word about our country – Latvia. Another thing is that each application must be evaluated individually, because there are no two identical projects. It is hard work to select each month 15 finalists who will compete in the public voting for a chance to receive funding, because we receive so many good project ideas. Those applicants who have not succeeded we invite to keep a stiff upper lip and apply again, because there have been cases when a project does not win the first time, but applies again and receives the funding. Therefore it is so important not to give up after the first failure. 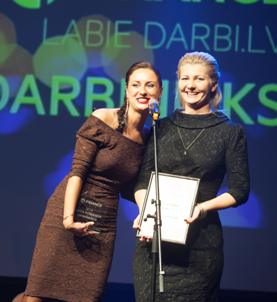 LabieDarbi.lv has been very successful in marketing. How do you promote the project contests? Although we have had advertising campaigns during these four and a half years, the best way how to promote LabieDarbi.lv project contest is by doing the job wholeheartedly — supporting good and socially important initiatives. If people know that the chance of getting money for implementing their idea with the support from LabieDarbi.lv is real and comparatively simple, they will apply and also encourage their friends, relatives and neighbours to take part in this project contest. I also assume that there are only a few people aged between 16 and 55 who do not know anything about project contest LabieDarbi.lv. And this awareness cannot be achieved only with the help of advertising, but also with the recommendations from other people. Which type of media has been the most useful one when it comes to communication with the public? During these four and a half years, we have established good cooperation with the largest regional media representatives in Latvia. And it is understandable, because project applicants come from different regions; they are very active and of course want to win, so they use all the possible ways to get more and more supporters. Another thing is that regional media often publishes information about projects which competes in LabieDarbi.lv contest and it is a great opportunity for all applicants to get even more votes also from unknown people because local inhabitants are very supportive and they will give their votes with big joy. Regional media also reflects how the opportunity to implement a project with the support from LabieDarbi.lv has changed the lives of local people. They are proud of all individuals and organisations who have received honours in the annual LabieDarbi.lv Awards. After this event there are often a lot of interviews with these people who did get these awards. Cooperation with national media is not as successful as with regional, because their agenda involves dealing with national developments and less with human-interest stories. Nevertheless, I go to the interviews with national media to speak about donation trends and also about the reasons why companies must have corporate responsibility, because charity initiative LabieDarbi.lv is one of the best examples of corporate social responsibility in Latvia. How did you manage to develop LabieDarbi.lv into a successful brand? There isn’t a special formula or a complex marketing strategy. We, LabieDarbi.lv team, try to do everything for 200 percent in our daily work in order to help people implement their plans! We speak on the phone with every project applicant, or sometimes even in person, and we suggest the best solutions. And it results not only in many greetings on the streets, in various events, etc., but also in LabieDarbi.lv essence – being a brand that Latvian people rely on and approve. What firstly attracted you to work for LabieDarbi.lv? It definitely was a possibility to help people accomplish their ideas. I feel satisfied when I see children in small Latvian town who can now play in a modern playground thanks to our support or a programme about important but complicated topic — children’s homes and adoption which can be shown in the national TV channels broadcasts because of our support. These, of course, are only some examples, because totally there are over 200 projects, which have been implemented in these four and a half years with LabieDarbi.lv support. Since becoming a project manager, what is the most important thing that you have learned? That working day does not begin at nine o’clock and end at six o’clock, when you can turn off you computer, close the door of your office, and forget about your work. After these years as a LabieDarbi.lv project manager, I have realised that you have to love your job in order to be successful at it. You may be the best manager or director in the world, but nothing will work if you do your job unwillingly or carelessly. One more thing I have discovered while working at LabieDarbi.lv project contest is that you have to understand what your target audience is and how to communicate with it in order to understand its needs. Probably LabieDarbi.lv would not been such a well-recognised brand in Latvia if there wasn’t this daily communication with project applicants and implementers because in that case we would manage our work based only on our understanding about people needs. So far SMSCredit.lv has invested over 1 million euros into LabieDarbi.lv! You must be very proud of all the hard work. How did you manage so many successful projects? I think that, first of all, charity initiative LabieDarbi.lv has been one of the most successful examples of corporate responsibility in Latvia since the moment when SMScredit.lv, initiator of LabieDarbi.lv, came up with the idea to create their own corporate responsibility project. They chose the hardest way, which proved to be the most successful one in the long term. It would be definitely much easier to donate money to everyone who asks for it, but SMScredit.lv chose to invest in the development of the society purposefully by determining clear criteria for claiming financial support in order to implement an idea. Do you have a motto in business? If you want to achieve good results, don’t be afraid to invest time and other resources and always try to do more and better than people expected from you!